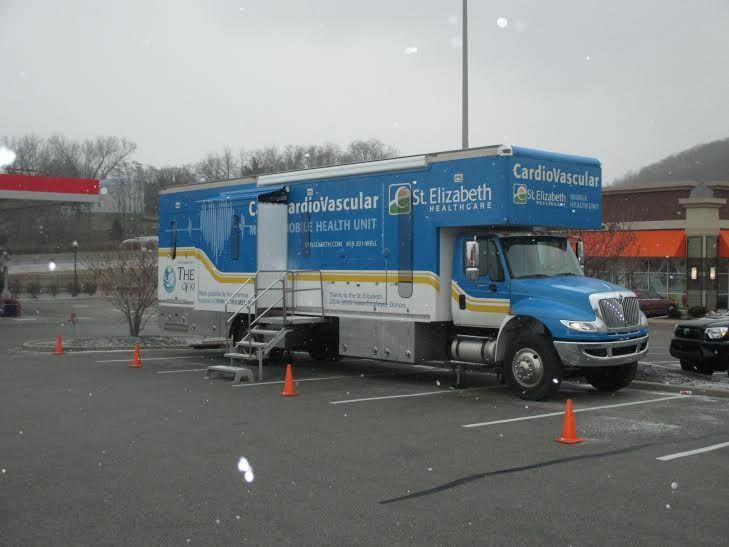 February is National Heart Health Month and St. Elizabeth has made it easier on local people to have their heart screened with their Cardiovascular Mobile Health Unit touring Northern Kentucky. The Cardiovascular Mobile Health Unit was in the parking lot of the Newport Kroger recently to provide those with scheduled appointments the various heart screenings they offer and The River City News got a look. Individuals can choose from four different screenings offered depending on the risk factors that person may be aware of. 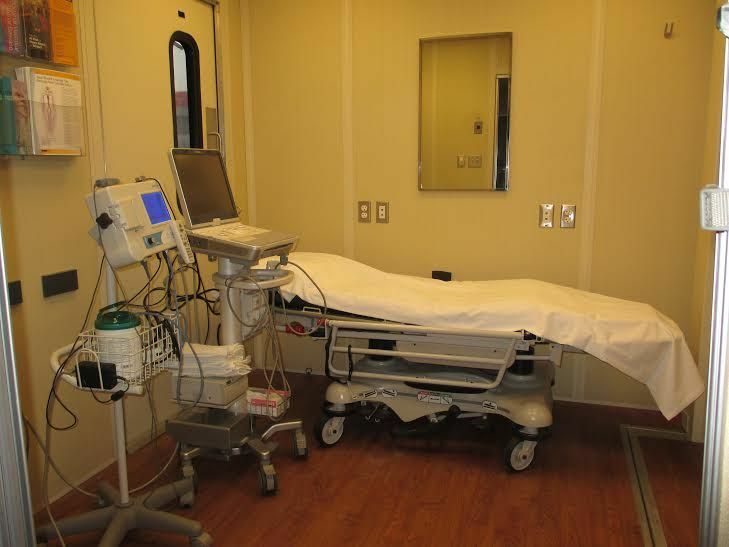 The Mobile Unit is a truck with two examination rooms complete with a host of medical equipment including various ultrasound technology. “A lot of days we're really busy. We usually have both rooms going,” said Bruce Smith, a registered vascular technologist for St. Elizabeth. Typically, the screenings take about ten minutes and cost $25. The screenings help detect risky health conditions, including carotid artery disease, peripheral arterial disease, and abdominal aortic aneurysm. Chuck Beatty, special projects manager at The River City News, originally scheduled a session for the Abdominal Aortic Aneurysm Screening, but when Smith said that typically men of Chuck's age (39) who don't smoke, rarely have any risks of an abdominal aortic aneurysm, so Chuck went with a carotid screening instead, which looks at the blood flow traveling to the brain. Smith began the session by taking Chuck's blood pressure and found that he fell into the middle category. Next, Dr. Smith had Chuck lay down in one of the examination rooms and gave him an ultra sound which showed how the carotid vessels branch and where the plaque in the arteries gets collected. Because one of the vessels travel up to the brain, it is a potential site to cause a stroke. The ultrasound is a Doppler effect machine that detects motion and can be color-coded to allow medical personal to easily see the activity of the blood flow inside a person's body. It also uses pulse Doppler which can be used to measure velocity of blood flow. Smith said that the color Doppler tells him what direction the blood is flowing. When he aimed the ultrasound towards Chuck's heart, it showed up red. When he angled it away, the color changed to show Smith the blood was traveling away from Chuck's heart. The readout showed that Chuck's blood flowed through his carotid artery at 80 centimeters per second, which is well within the healthy range. Chuck's father had a minor heart attack three years ago which prompted Chuck to have the screening done. “With my family history it was worth the ten minutes for the peace of mind factor. I would recommend it to anybody who has any kind of concerns about their heart. It was quick and easy,” Chuck said. The dates, locations and times of the Mobile Unit can be found at http://www.stelizabeth.com/screenmyheart, and those interested in making an appointment should call (859) 301-WELL (9355). The screenings are usually not covered by most health insurance plans.